The mother of a 17-year-old accused of killing the grandfather of his girlfriend is speaking out, asking him to turn himself in. 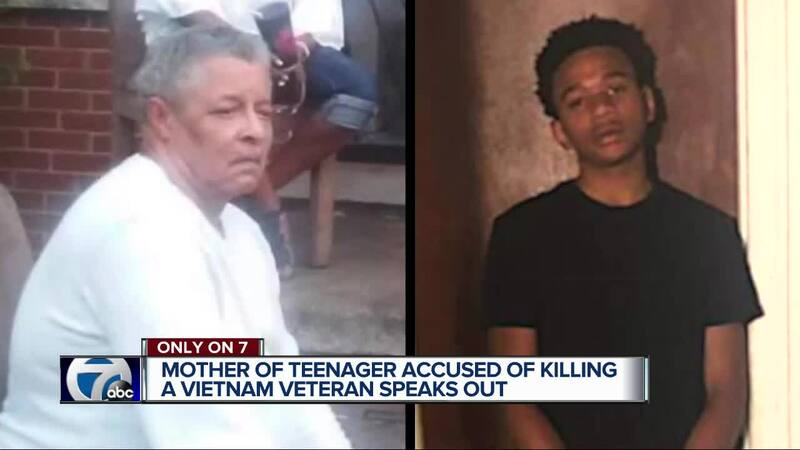 DETROIT (WXYZ) — "I don't know if it was a self defense or what, but he had been seeing this young lady," said Teneal Johnson whose teenage son is now accused of killing 70-year-old Jamie Mintz early Monday morning in Mintz's home on Mansfield in Detroit. Johnson's son, 17-year-old David Williams, was dating Mintz's 14-year-old granddaughter despite their parents and other relatives trying to keep them apart. "David, if you see this, please come to me! I got your back," said a tearful Johnson as she pleaded on 7 Action News for her son to come forward. "David, I got your back! Please come home." On Thursday, Detroit police released photos of David Williams as they search for him and hope for the public's help in locating him. It was late Sunday night or Monday morning when Mintz's relatives say his granddaughter secretly let David into the house. Around 4:00 a.m. the teens turned on a light and it woke Mintz up out of his sleep. Mintz found David Williams in his house and, according to relatives, he wanted David to remain there until he alerted police and they arrived. David Williams was already on probation in a domestic violence case involving an alleged assault on his stepfather, and we're told he feared going back to jail. Detroit Police say the teen struggled with Mintz, wrestling the gun away from him and shooting him. Mintz, a Vietnam veteran, was killed and the teen fled the scene on foot. Teneal Johnson says she saw her son Monday afternoon and he seemed fine. She said he gave no hints that hours earlier, he had a deadly encounter with his girlfriend's grandfather. The father of Mintz's 14-year-old granddaughter, Melcolm Appleton, tells 7 Action News that Mintz would be alive if the state social workers had not forced her to be temporarily removed from their home and placed with Mintz for two weeks. Appleton says he tried to tell state workers that his daughter was making up lies about him and his wife because she was upset that they were trying to keep her from seeing David. Appleton says his daughter is now devastated over the devastating loss of her grandfather and she now regrets ever sneaking David into the house. Teneal Johnson fears her son has done harm to himself because it's been days since she's heard from him. "I'm on the news," she said. "I probably look a mess, but I'll do it for you. I'll do it all for you. Just please come talk to me." Anyone with information on the whereabouts of 17-year-old David Williams is urged to call Detroit Police Homicide Unit at 313-596-5634 or Crime Stoppers at 1-800-SPEAK-UP.